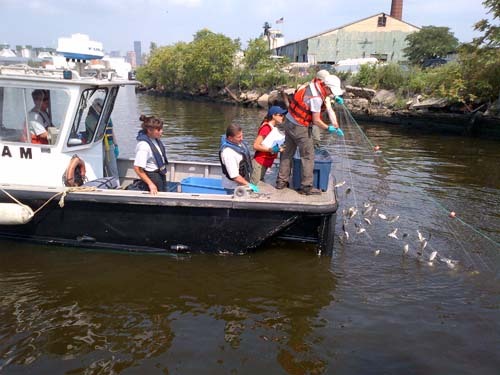 Fish community survey on Newtown Creek. Newtown Creek as it enters the East River. "Newtown Creek, which sits in the heart of New York City, has been part of our country’s industrial engine for such a long time. It’s so exciting to have the opportunity to finally address the contamination of this waterway and to bring back the resources it should be providing to the public." For over 150 years, releases of PCBspolychlorinated biphenyls; a class of chemicals previously used in manufacturing that remain in the environment for many decades, accumulate in living creatures, and pose health hazards to humans, wildlife, and fish., heavy metals, VOCsVOCs/volatile organic compounds—A group of toxic and carcinogenic chemicals frequently found in industrial waste. Injuries to aquatic organisms may occur where groundwater contaminated with VOCs discharges to surface water., pesticides, PAHspolycyclic aromatic hydrocarbons; a group of organic contaminants that are often the byproducts of petroleum processing or combustion. Many are toxic to aquatic life and several are suspected of causing cancer in humans., and other hazardous substances from the many industrial operations along Newtown Creek have resulted in degraded water quality and contaminated sediments. Oil has been seeping into the creek for decades from an underground source containing millions of gallons. The freshwater flow to Newtown Creek derives entirely from groundwater, stormwater, and wastewater discharges. The creek drains into the East River, a tidal strait connecting Upper New York Bay to Long Island Sound. EPAU.S. Environmental Protection Agency; federal agency with the mission to protect human health and safeguard the environment. listed Newtown Creek as a Superfund siteAn uncontrolled or abandoned place where hazardous waste is located, possibly affecting local ecosystems or people. Sites are listed on the National Priorities List for evaluation and cleanup by the U.S. Environmental Protection Agency. in 2010. An investigation is continuing to identify the full extent of the contamination. At least 12 million gallons of oil from the seepage site has been recovered. Contaminants in the creek have severely impaired the quality of surface water and habitat. The area is home to many species of fish and aquatic wildlife, as well as waterfowl and other water-dependent animals. All of these organisms are at risk of health and reproductive effects due to exposure to PCBs and other toxins. Assessment of the extent of any natural resource injuries is ongoing. Fish and crab consumption advisories A federal, state, or local government recommendation to avoid eating a certain fish or shellfish because it is unsafe due to high levels of contamination. are in place for Newtown Creek, including a ban on eating fish and crabs by children and women of childbearing age. Recreational opportunities have also been negatively affected. In 2012, NOAA and other trusteesGovernment officials acting on behalf of the public when there is injury to, destruction of, loss of, or threat to natural resources. completed a preliminary assessment screen, the first step in the Natural Resource Damage Assessment Investigation performed by trustees to identify injuries to natural resources caused by oil spills, hazardous substance releases, and grounding incidents in National Marine Sanctuaries, and plan restoration activities. The goal of NRDA is to restore natural resources and compensate the public for lost recreational use. process. Contaminants in the creek have severely impaired habitat quality. The area is home to many species of fish and aquatic wildlife, as well as waterfowl and other water-dependent animals. All of these organisms are at risk of health and reproductive effects due to exposure to toxins. Assessment of the extent of any natural resource injuries is ongoing. Fish and crab consumption advisories are in place for Newtown Creek, including a ban on eating fish and crabs by children and women of childbearing age. Other recreational opportunities have also been negatively affected.